No prior horse experience is necessary, and the sessions do not include any riding. Activities and interactions occur "on the ground" where the benefit of the horse as therapist-partner is the most powerful. 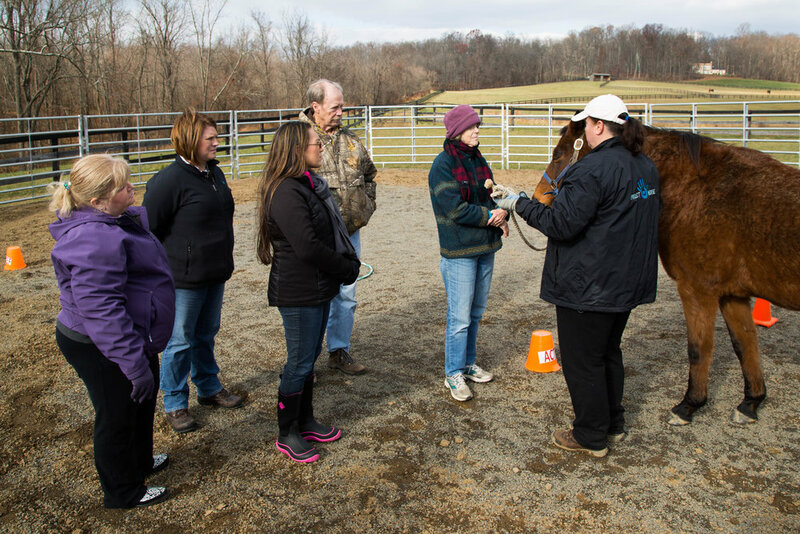 Unhealthy patterns and behaviors are uncovered in the paddock, and new skills and thought patterns can be put into practice in a safe, nurturing environment. The horses provide thought-provoking, instant feedback and are always "in the moment". Therapy services may be eligible for reimbursement. Learn more on our FAQ page. Therapy is tailored to an individual's, family's or couple's treatment goals, in coordination with your primary therapist. If there is no primary, our therapist will do an intake assessment where you will help formulate treatment goals. Individuals with similar goals and challenges enjoy the supportive environment provided by our wellness and therapy groups that are offered throughout the year. Therapy groups are led by a therapist, and the group meets weekly at a designated time. We offer custom programs and workshops for private schools and residential facilities.